Maybe it's like childbirth. How we conveniently forget the pain, the contractions. And somehow we find ourselves happily going through it all over again. That must be what was happening when I decided to do the "chicks in the bathroom" thing again. The chickens have launched a complete take over of the downstairs bathroom. The large green plastic tub that was formerly their home just wasn't cutting it and appparently unlike their mild-mannered predecessors, it wasn't enough space. Every time I, heaven forbid, had to use the downstairs bathroom for its intended purpose, I had to first remove a roosting chick or two from the seat of the toilet. (a down toilet seat, of course.) Within seconds of plopping them back in their home there would be another, jumping at my thigh or flapping up to the edge of the box. That's when it occured to me that we could give them the whole back corner of the bathroom. Which means, I guess that I'm the one responsible for the take over. And perhaps this also means that maybe it is a good thing that this little bathroom never saw a minute of remodeling work. So I called Dan at work and asked if he could finagle some sort of barrier, he said it wouldn't be hard and by nightfall they had the run of the place. Yesterday afternoon, Emma had a friend over and the mom stopped in to see the chicks. She's curious about the whole process and thinking of trying her hand with chickens. She leaned over the large plywood barrier, looking at the chickens running willy-nilly on my bathroom floor which is now covered with both a tarp and layer of shavings…"Now, what is the advantage to getting chicks instead of older hens that are ready to go out in the coop?" It's fun? They were cute for three days before they started to get their pin feathers? They'll be tamer when we put them outside? I like the way they make my whole downstairs smell like a chicken coop? It gives my children something to do while they're on the potty? Life was getting boring and I needed a little something to fill all my free time? Well, really. It's not that bad. At least not all the time. There is enjoyment in the process. Like it or not, we are becoming attached to these six feathered characters taking up residence in our bathroom. And some day these girls will begin to give back. We just have to keep our eyes on the egg. Oh me– i just about cried when I read this. My “babies” -three roosters a hen and a not sure(we thought they were all hens whoops)- are currently in our green house, which you have to through to get to our front door. which because I have four children stays open all day even in 95 degree heat. The smell is not at all country farm like. I have also lost too many chicks to speak of. The last batch we did get full grown and the neighbors dog thought they were toys. Now we have reinforced the coop and started over, why, because without babies life gets predictable and even dare I say easy. My babies give us all something to wait for. That first perfect surprise, that first morning you go out to the coop and there is a nearly golden egg waiting for you. It’s like the first time your human baby looked at you and said potty! You call everyone. You save it and you mark your calendar, for this is the day your fuzzy little peep became a glorious symbol your ability to have eggs any way you choose. Hah, this all sounds quite familiar. I just moved my not so little chicks out into their permanent home in the coop, but the mess they made before that? I feel like I’ll never get pine shaving dust out of my nose! And am I seriously thinking of doing it again in a few weeks with some bantams? You bet. The eggs are so worth it. Life was getting boring and I needed a little something to fill all my free time? Exactly. Oh, Molly, you rock my socks. We keep ours in the upstairs bathroom, in the huge clawfoot tub, and your blog post has my husband and I both laughing out loud – thank you! This is our 2nd year of doing it and yes, we will be right back at it next spring. one of our feed stores just got in a good batch of chicks and I’m tempted. Sorely tempted. Just one or two, you know, to make life more crazy than it already is. 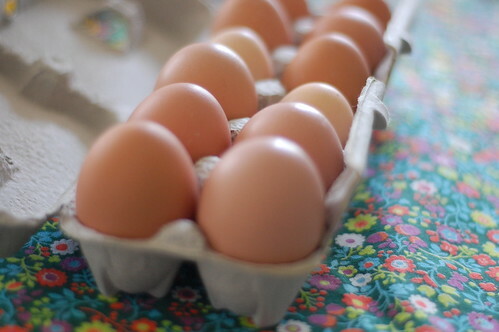 We have chickens too and you are so very right…keep your eyes on the eggs….I gave up trying to work out how much our first egg would be worth in monetary value….we love having them. yep..all those sweet feathered beings are worth it. I just got three very stinky ducklings out of my bathtub a few weeks ago…. two things: one, when you started out with birth/labor analogies i thought you might be commenting on how marvelous it is that these ladybirds pass a relatively large egg almost every day. now that’s something to squawk about! and two, i thought surely you’d have more than 6 the way you were speaking about it all, but then i remembered we have only 3, and it’s amazing the mess even just three little chicks can make in one’s kitchen. oh, and i think calder and i might do a little study buddy project this spring. he’s noticed the new growth tips on the doug firs – thinks they’re flower buds. i bet it’ll be neat for him to see that it’s really brand new fingers of needles/branches. a great idea keeps on going! I really love eggs that’s why my cholesterol are high.